Links, Homes made for birders. 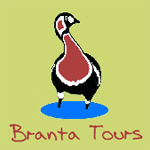 Branta Birding Lodge & Conservation Centre, overlooking Durankulak Lake and Black Sea, is ideally situated for visiting many top birding locations, endless and peaceful white-sand beaches and important protected areas. Mladen Vasilev is very keen on wildlife photography and has published many photos in Bulgarian and European magazines, brochures and websites. A human edited birds Web Directory. We also organize different tailor-made tours according to the preferences of our clients. Our philosophy is to promote a tourist product for small groups and decrease the impact on the nature and the local population.